Common ways to stage out buttons and links to connect with a Chime queue. 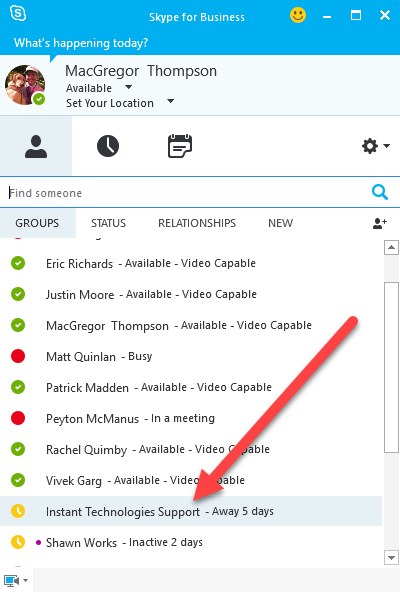 If your users will be using Lync/Skype for Business, this is a great choice. It's not only the easiest but the quickest as well. A user can simply start a chat with the dispatcher with will then route that chat to an agent in the queue. Quickest and easiest. Users don't have to go to a web page to get help. Some features are unavailable when not using the web client. E.g. Session rating. Federated users outside your organization can connect to Chime via Lync/S4B the same way as users inside the organization. All they have to do is initiate a Lync/S4B chat with the queue dispatcher and they will be routed to a Chime agent. This button can either point to the web client, or be used to open a Lync to Lync chat with the dispatcher. More control over where users can come from. Can link to the web client or the Dispatcher's sip uri which would start a Lync/S4B chat. Not as easy as simply adding the dispatcher to your Lync/S4b buddy list. The web client is accessed by opening a browser window to the url for the webClient.html file, with parameters for the queue to hit, and optionally the user connecting to the chat. To open the web client, first we need to know a couple of values. Here are some examples on how you might open a chat session with a queue. These examples assume you have jQuery on your page. Sample Button Markup - The queueId (integer) is included in the markup data-queueid="queueId"
<!--Using the data-queueid attribute allows the use of the same script for all buttons. // In this example, we leave off the last number in the URL which signifies the queueId. // It will be concatenated when we call our startChat() function. If you want to allow access to the Chime web client outside your organization, there will be some additional setup required. You can place a click-to-chat button on an external web page by using one of the options below. Place a click-to-chat button on a DMZ exposed web page that uses Chime Hub as a proxy. Chime Hub provides a cloud based service to quickly extend your Chime on-premise installation to support external websites and portals. This is the easiest of the options to set up, but some features are limited because of security reasons. There is more on this below. Place a click-to-chat button on a DMZ exposed web page that uses a reverse proxy to communicate back to your internal Chime server. Place a click-to-chat button on a DMZ exposed web page. A benefit of this choice is it gives you the entire web client feature set, however, it is not as secure as the previous 2 options. Warning - Using sip: requires the Operating System to know what application will handle the SIP protocol. Lync/S4B should register itself with the OS as an application that can handle the SIP protocol, but we have seen instances where older Lync/S4B clients might not register themselves correctly in the OS, especially on Mac OS. This is a great way to expose your help desk to people who use Lync/S4B directly from your email. It is no different than composing a web link on a web page, but is just inside an email signature. 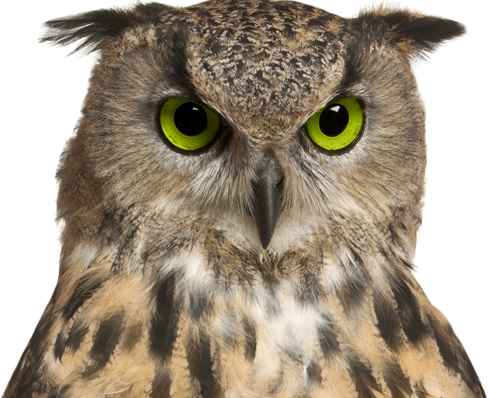 We will want to use the dispatcher's SIP address in the link. Note - If the Start Chat! links below do not open a Lync/S4B chat window, then this feature will not work for you. 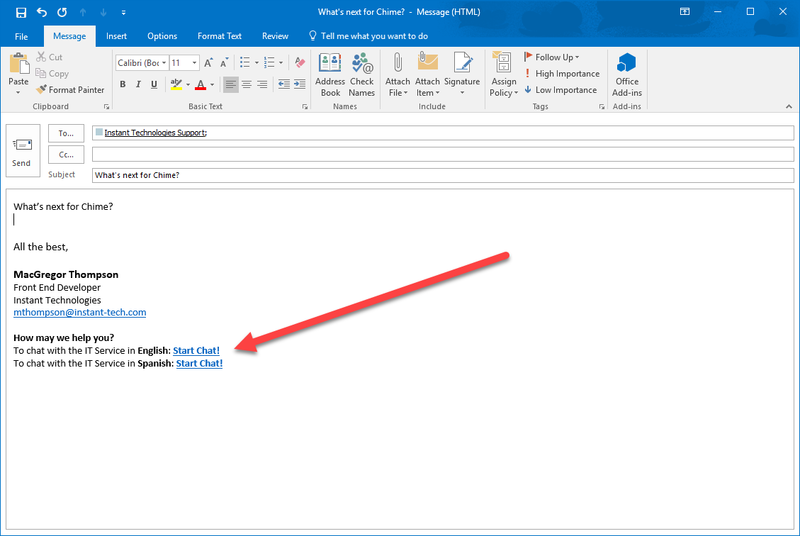 To chat with the IT Service in English: Start Chat! To chat with the IT Service in Spanish: Start Chat! This is a great way to expose your help desk to people directly from your email. It is no different than composing a web link on a web page, but is just inside an email signature. This is probably the simplest example of using the web client. All you have to do is add a web link that points to the web client url. To get help, click Chat Now! This is probably the simplest example of initiating a Lync/S4B chat from a web page. All you have to do is add a web link that points to the SIP address of the queue's dispatcher. Note - If the link above does not open a Lync/S4B chat window, then this feature will not work for you. Allows you to expose your queue to the DMZ while keeping Chime behind your company's firewall. The ChimeHub web client does not contain all the features as the regular web client for security reasons. The engine name is the name registered with the ChimeHub service, in the Admin > Advanced settings area within the Chime application. The Queue ID is an integer representing the internal ID of the Queue in your Chime system. 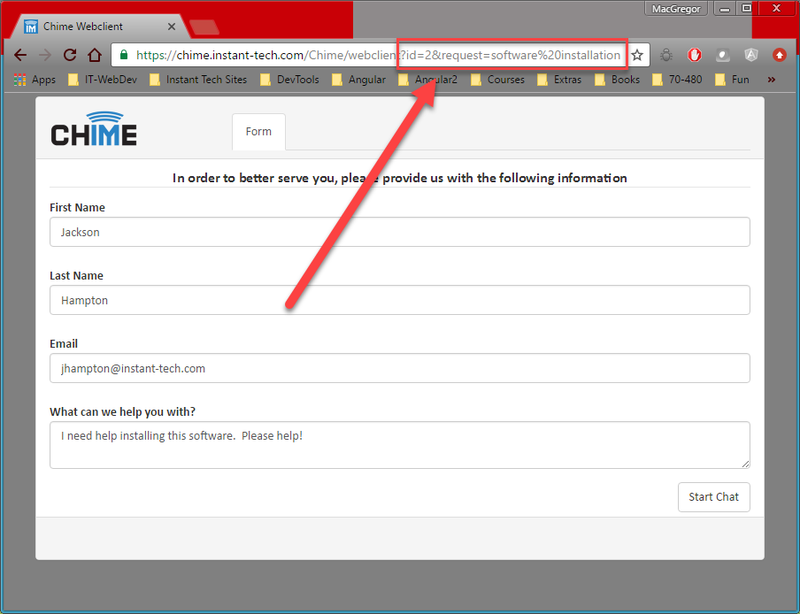 This can be seen retrieved from the Advanced tab in the Queue Settings for the queue, where Chime displays the URL needed to open a chat window through ChimeHub. Click steps to expand for screen shot examples. Note: User must have admin rights to follow instructions below. 1) Click the Admin section in the upper right hand corner. 2) Click the Settings tab on the left side. 4) In the form labeled Engine ID: please create your own custom ID. 5) Click Check Engine ID to make sure the ID you created is available. 6) If the ID is available, click the Request Activation to bring up an information modal. 7) Fill out your company name and please use a good contact email address for us to notify you when your Chime Hub URL is ready to be used. 8) Click Request Activation to notify us about your request. 9) Click Save to finish the initial setup. Before going forward, you MUST wait for a confirmation email from us notifying you that the Chime Hub url is up and ready to be staged. 10) After confirmation, click Queues at the top right corner. 11) Click the Queue Settings icon. 12) Click the Advanced tab at the top. 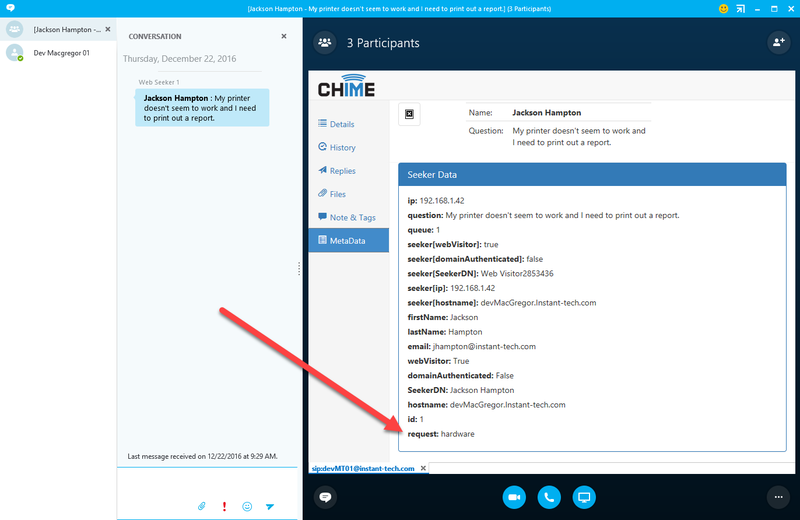 13) At the bottom is the necessary URL for the Chime Hub web client. Copy it for its appropriate use. What is Skill Tag Routing? 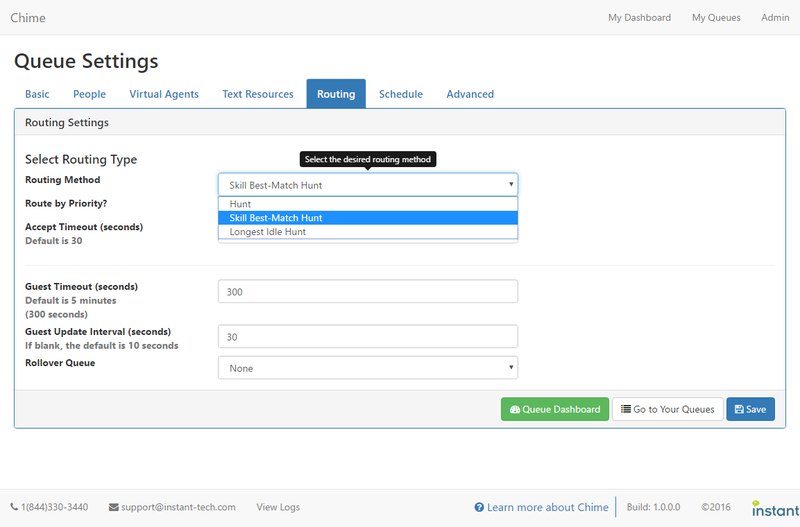 Skill Tag Routing, or specifically Skill Best-Match Hunt, is one of Chime's 3 routing methods that will route guests with specific problems to agents who have matching skill sets (tags). For example, a guest who needs help with their hardware starts a chat with the queue. Chime will first try and route to an available agent with the matching hardware skill tag before routing to the next available agent. Adding custom information to the inbound session is easier than you think. All you need to do is add it to the URL via one or more query string parameters. It is through this mechanism that the web client grabs the queue ID and routes the guest to the appropriate queue. For example, with the URL https://chime.instant-tech.com/Chime/webclient?id=2, the web client knows to route the guest to the queue with an ID of 2. 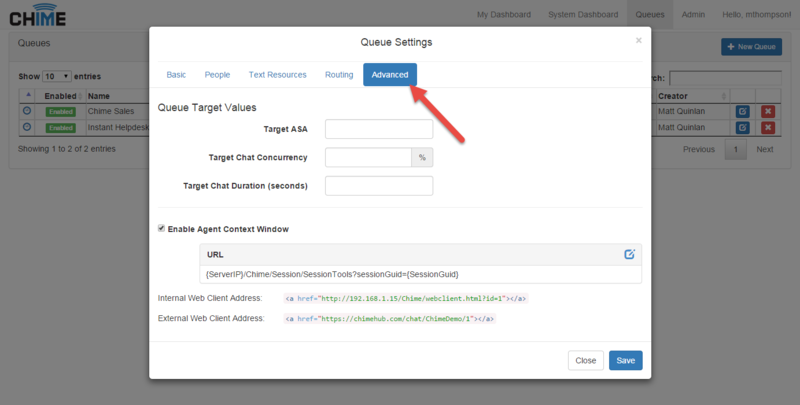 The Chime web client will automatically grab all query string parameters and display them to the agent with the other information in the MetaData tab of the Agent Context Window. This means you are not limited to just one or two but can add several different parameters if you wish. See the screenshots for a look at how query parameters in the example URL and others below will be rendered to the agent in the Agent Context Window. The beginning of a query strings is denoted by the ? (question mark). Everything before is deemed part of the URL path to the web page itself. The & (ampersand) is used to separate sets of query string parameters. Notice how we have 2 query string key/value pairs in the example. Spaces are translated into %20 in a URL. This is important to remember if you are adding the query string parameters directly to the URL via HTML. A space in a URL can cause the page not load correctly or even at all. Some browsers are smart enough to replace a space before trying to load a URL, but it's good practice to replace all spaces with %20 beforehand. Warning... 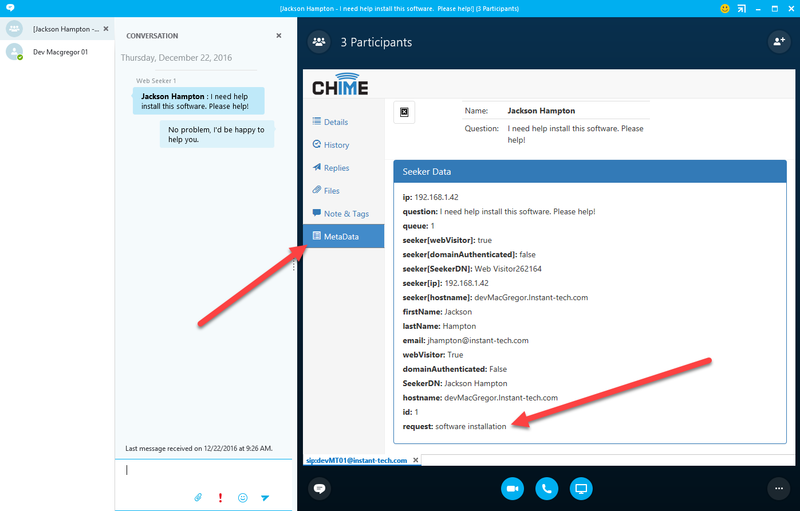 There are several parameters the Chime web client uses to store information about the guest as well as the session. Please be cognizant of them to prevent overwriting them unintentionally. Turn it on in the queue settings under Routing ( screenshot ). This will display a dropdown in the prechat form for the guest to select from a list of predefined skill tags, before being routed to an agent with that skill. Use the query string to set a skillTags parameter (e.g. skillTags=software%20installation) which we will cover in the following section. Now that we have more information, let's move forward with our example! 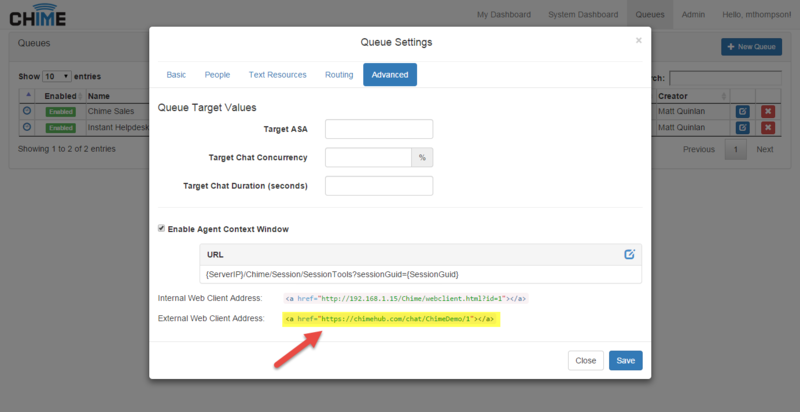 In this example we are adding the query string parameter directly to the URL of the web link. Both links have the same URL and open the web client in a new window (target="_blank") and add the query string parameter &request=software%20installation. Note - While both examples start a chat with the same queue, they demonstrate how different queue ID's can be used to initiate chats with different queues. <!--This code corresponds to the two buttons above. //for us behind the scenes. Adding custom information to the inbound session is easier than you think. All you need to do is add it to the URL via one or more query string parameters. It is through this mechanism that the web client grabs the queue ID and routes the guest to the appropriate queue. For example, with the URL https://chime.instant-tech.com/Chime/webclient?id=2, the web client knows to route the guest to the queue with an ID of 2.